A kayak can make navigating through the waters more enjoyable and simple, but there are so many models on the market that choosing the best one for you can be difficult. Sun Dolphin has established itself as one of the leading manufacturers in the industry, and their Bali SS Kayak is one model that will definitely make you stop and take notice. If you’re looking for a one-person kayak to ride on calmer waters, this model might be a great choice, but it may not be what you’re looking for if you want a tough kayak that can handle rough waters or seawater fishing. Let’s evaluate it in detail for you to better understand what you’re getting your hands on. The features found on the Bali are diverse in nature, making for a well-rounded kayak that offers a little bit of something for everyone. Featuring well-crafted designs, assorted features, and sturdy materials, this is one versatile kayak and one of Sun Dolphin’s top-selling models. The Sun Dolphin Bali SS Kayak is available in red, blue, green, ocean, pink, and tangerine colors. Weighing in at 45 pounds, this model uses a high-density polyethylene called Fortiflex in its exterior construction. The solid construction allows the user to stow it away wet, without having to worry about a material breakdown. The Fortiflex construction is also UV stabilized, which means it won’t fade with prolonged sun exposure, while the polyethylene materials promote the paddling and tracking ability of this compact watercraft. This means the user can now cruise down a river or lake with maximum stability and supreme ease. If you’re an avid paddler, you probably don’t like hitting the water unprepared for the number of unexpected occurrences that can plague you when kayaking. That is why most kayakers hit the waters with a change of clothes, a variety of gear, food, water, and other must-have supplies. Fortunately, this model has the space to accommodate your needs; all thanks to its built-in storage compartment which is designed to keep all of your personal belongings safe and dry. If you need more space, you can take advantage of the portable accessory carrier, which acts as a tow-behind or backpack that’s also perfect for storing gear and keeping it dry. Whether you’re using a kayak for fishing or family fun, you need a model that offers more comfort. Riding in a kayak that’s comfortable allows you to cover longer distances without experiencing pain in your back or legs. This model features a large, comfortable seating area complete with thigh pads for maximum comfort when you’re spending a long day out on the water. Also, like most models of sit-in kayaks, the Bali features an open, large cockpit, making it pretty easy to get in or out of it. The built-in paddle holder is perfect when you need to keep your hands free, while the adjustable foot braces will allow you to settle comfortably and securely in your kayak. Do take note though that the kayak doesn’t come with a bottom cushion on the seat and the footrests aren’t very comfortable for some users. Likewise, this product doesn’t come with scuppers to drain the cockpit, like the one you’d find on an ocean-ready kayak, which makes this model feel a little limiting. Nonetheless, this model is perfect for lakes and rivers and features a padded backseat that’s highly adjustable. Featuring improved stability, this kayak tracks well, making it the perfect hard-shell kayak for the beginner. This model is designed for solo use, but it’s large enough to take along a dog or small child, but just make sure you don’t go over the weight limit, which is 395 pounds. The hull’s design aids in stability, but it also takes away from the kayak’s speed ability. That is why this is a great choice for small lakes or rivers, but not for oceans and seas. If you’re looking for a kayak to take out on the ocean and do a little touring, you may need to spend a little more for a kayak with higher speed levels. This model is equipped with a paddle holder and retractable carry handles but isn’t rigged, so if you’re planning on using it for fishing, you’ll need to rig it yourself. This means you’ll need to plan on buying some rod holders, an anchor trolley, and other gear to set it up for fishing. The Sun Dolphin Bali SS is a great sit-on kayak, especially for beginning kayakers; thanks to its wide-based design. This may slow it down but alternatively provides incredible stability and tracking ability, helping the user paddle with ease. It’s also able to take a bit of a beating due to its high-density polyethylene construction which also explains how Sun Dolphin have managed to keep it so lightweight while still being able to support enough weight. 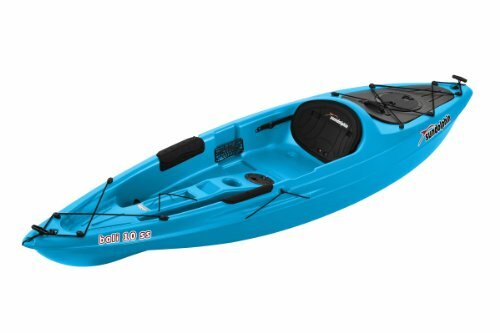 Not only focusing on a sturdy construction, but this kayak also comes with an array of extra features such as its P.A.C (Portable Accessory Carrier) which is great for extra storage that can be worn as a backpack or towed behind the kayak. If you’re still struggling for space, you can keep your valuables in the Sun Dolphin’s built-in, dry storage compartment. If you’re looking for another option, then the Riber 1005 might be worth a look. It falls into the same price level as the Sun Dolphin Bali SS, but due to its design, it offers a bit more speed which might be preferable for more experienced kayakers. You’ll also benefit from two lockable storage compartments as well as included fittings for a fishing rod holder. However, as opposed to the Bali SS, there is not enough seating and legroom, which is something that tall and larger-sized individuals should consider. There is also an affordable option of a sit-in kayak, and if you’re looking to stick with a brand you know, Sun Dolphin offer the Aruba SS. It includes similar features to that of the Bali SS but does include little extras such as its thigh protection pads or the option of adding a hands-free electronics console like a Bluetooth speaker and a dry bag. Sun Dolphin Bali SS Kayak is a family-oriented model that is designed to simplify the paddling process while also maximizing stability as you easily slice through calm waters. Whatever your paddling ability, size, or age, this kayak is pretty flexible and user-friendly, so you’ll definitely have a great time on the water. All in all, it is an excellent recreational kayak that can still be used for fishing as long as you have the right accessories.